Does this shape appear in other series? No, not exactly. Later Series 100 is similar to 1/12 but somewhat plumper. Later Series 177 and 'A' Series / Kerryl A91 also used this shape but with an extra 1950s-style feature of round holes at the shoulder ('gladioli' vases), and Early Series 41 was "same as 1/10 with handle" (see below). Four sizes are recorded, with inch suffixes 8, 10, 12 and 15. Base inscriptions like these, with both a number and a date, are rare and of great value in piecing together the history of the Remued range. If you have any Remued piece with such an inscription we'd be delighted to hear from you. 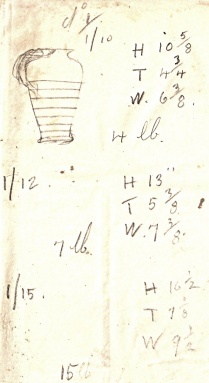 Height; from shape book, about 39 cm. Remued's larger size variants usually have an upper limit of 10 or 12 inches but here is a 15 inch vase! - one of the tallest pieces known. 1/8 is known to have been in production in 1934 (based on the dated pieces above) but by the time this shape-book entry was made it had apparently been dropped from the range. The shape-book entry for Early Series 41 says "same as 1/10 only Hld" (handled). No example is recorded for Early Series 41 however, and as can be seen here, 1/10 did appear with a handle. Its shape-book entry also shows a handle. Redcoat Soldier Antiques, Sale Vic. As noted above, Early Series 41 appears in a shape book annotated 'same as 1/10 only handled'. This piece has no handle and its size matches not 1/10 but 1/12. It looks like it was initially incised 1/12, with the 1 being subsequently (and mistakenly) "corrected" to 41.